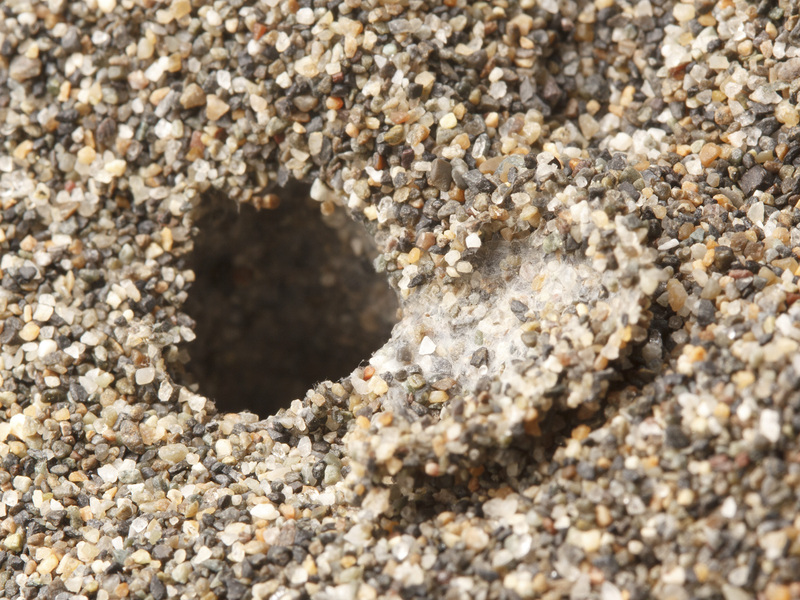 On a walk at Iona Beach a couple of weeks ago with Sean (who kindly provided all the photos that follow) I came upon a small hole in the sand, and after poking at it a bit, realized it was a silk-lined burrow with what looked like a trap door. We tried to figure out who lived there, but didn’t find anyone inside. The mystery burrow where this natural history adventure all began! 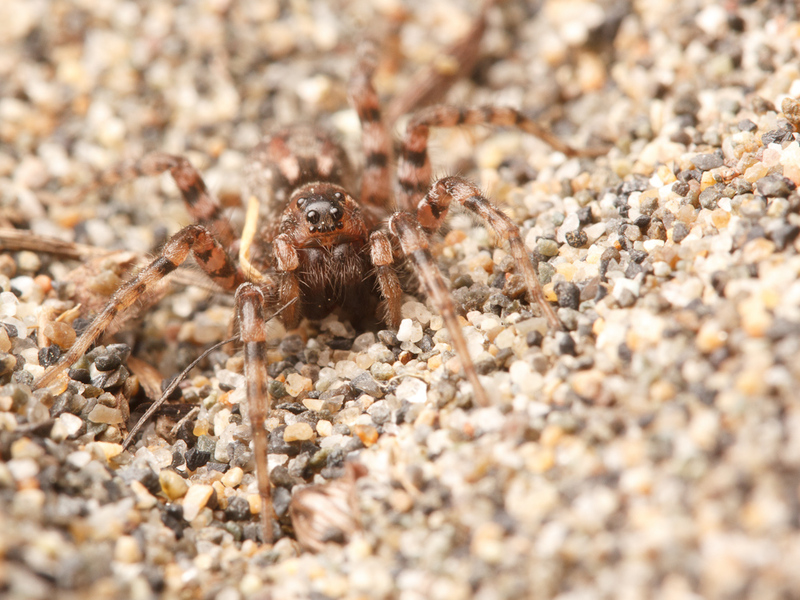 I went home puzzling about the mysterious burrow-dweller, and emailed our local spider expert Robb Bennett to see if he had any idea what kind of spider the owner might be. His response that it was probably a wolf spider burrow came as a surprise to me. I don’t know a lot about wolf spiders (family Lycosidae), and although I have occasionally seen them hunkered down in shallow depressions under stones and logs, I wasn’t aware that many species build quite elaborate silk-lined burrows. As it turns out, some lycosids overwinter or oviposit in burrows, or hunt by waiting just inside the burrow entrance for prey. One genus, Geolycosa, spends almost its entire life underground, in burrows up to 17cm deep (Dondale & Redner 1990)! Before this mystery began, I had only seen lycosids associated with shallow burrows, like this one we found on Mt. Tolmie. 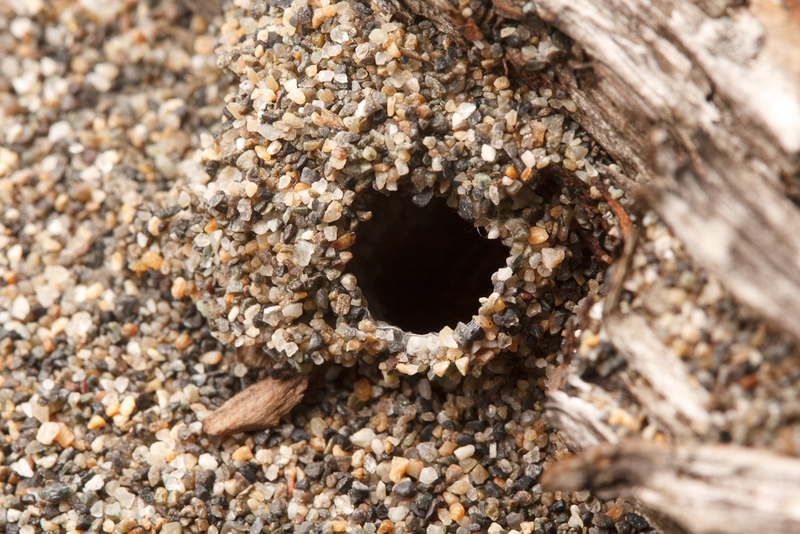 A few days later, we returned to the beach to look for more spiders and other arthropods. We encountered several jumping spiders, including this one. 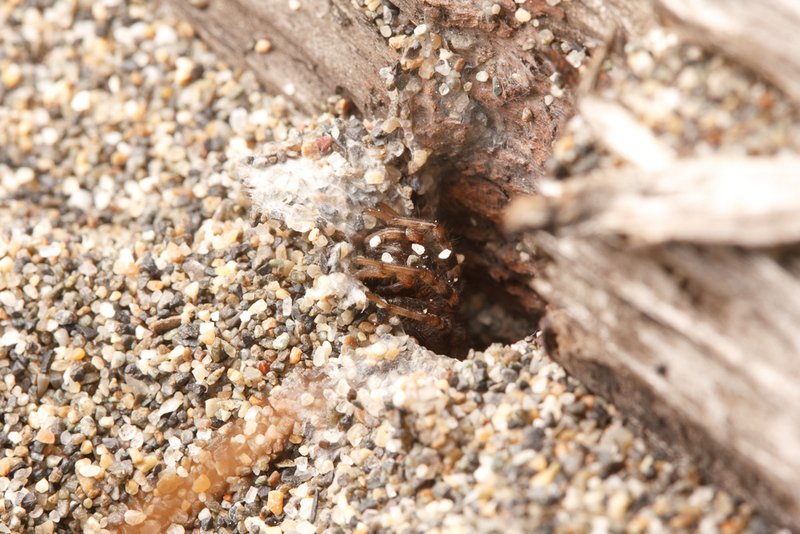 After a while, Sean spotted this beautiful and well-camouflaged male wolf spider. After being disturbed, this spider alternated between lightning-fast sprints and freezing with its legs splayed out against the sand. It takes full advantage of its banded legs and mottled body coloration, which allow it to all but disappear against the background! 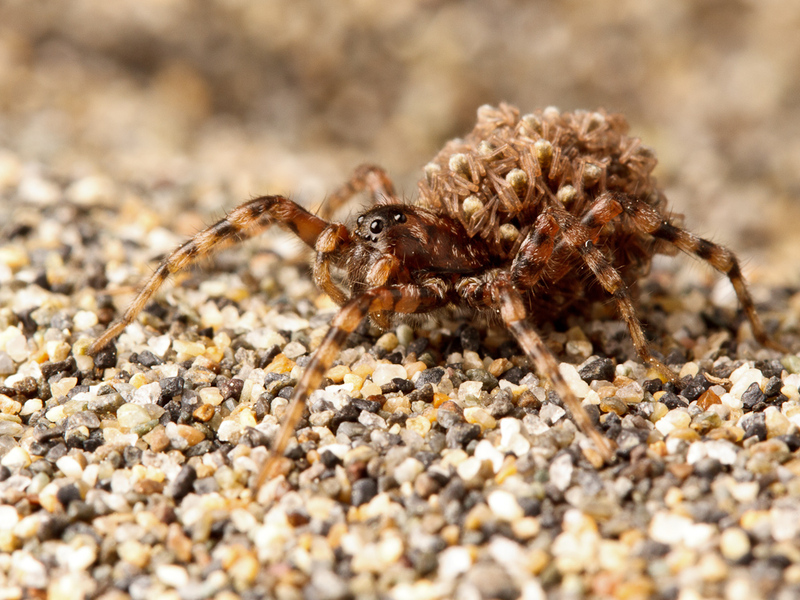 Next we encountered two females of the same species carrying their spiderlings on their abdomens. Lycosid females have special abdominal hairs onto which the inner layer of spiderlings cling (Rovner et al. 1973). The second female we found had a smaller brood of larger spiderlings hanging on mainly to the underside of her abdomen. Here’s a portrait of the same female as the previous photo, this time showing the characteristic lycosid eye arrangement. A little while later, much to my excitement, I came across another silk-lined burrow! Another mystery burrow, very similar to the original! Using a bit of dry grass to scratch at the sand-covered silk surrounding the burrow entrance, I was able to entice the resident spider towards the opening. And just like that, the mystery was solved! 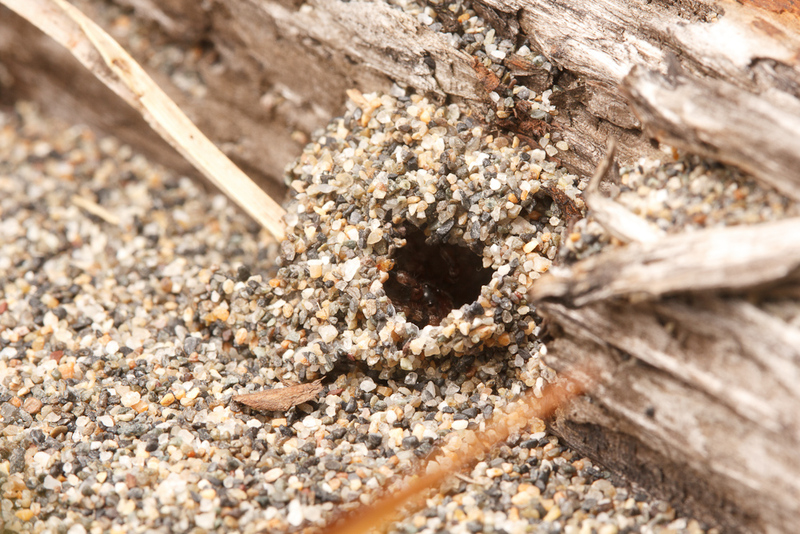 The burrow belonged to a female of the same wolf spider species we had been running into all evening as we explored the beach. 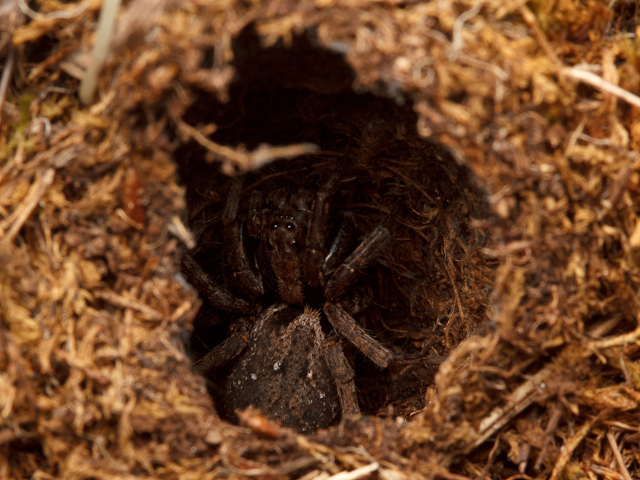 The spider soon approached the entrance of her burrow to investigate the source of the disturbance. After some more serious disturbance resulting in the opening of the burrow now looking a lot more like the (also disturbed) entrance of the original mystery burrow, the spider was persuaded to come out entirely. After a successful evening of sleuthing, we went home and identified our cryptic burrow-dwelling spider as Arctosa perita. This species is typically found on sand dunes or sandy heathland, and only the females construct silk-lined burrows (Dondale & Redner 1990). It is introduced to North America, and is apparently only present in certain areas of southern British Columbia. The similarly coloured beach wolf spider Arctosa littoralis (beautifully photographed by Ted MacRae here) is native to North America. The burrow entrance can be cinched up and made effectively invisible to humans, but this does not prevent some predators from detecting the spiders inside. In Britain, Arctosa perita is the preferred prey of the spider wasp Pompilus plumbeus, which uses a combination of smell and touch to locate the spiders within their burrows (Bristowe 1948). This spider (and other lycosids) can detect polarized light, and this species is somewhat famous for being able to navigate using the sun or the moon (references in Dondale & Redner 1983). 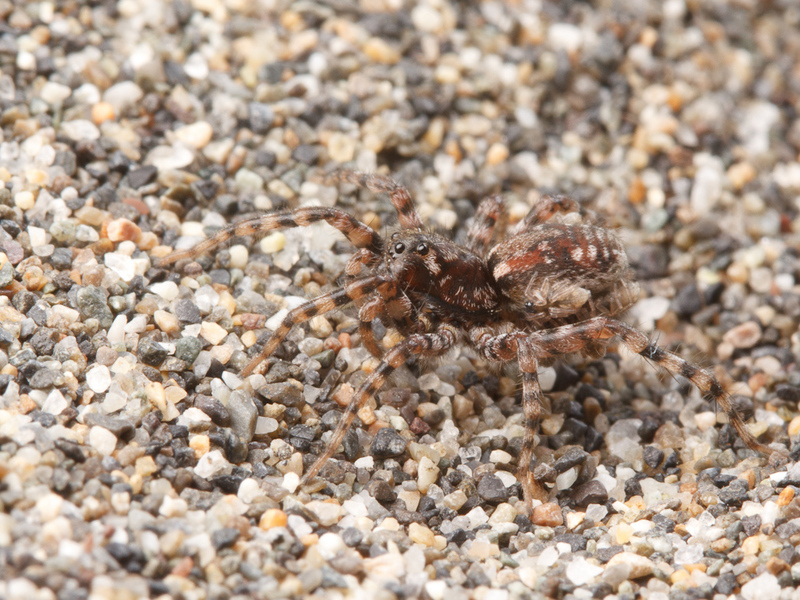 Arctosa perita doesn’t seem to have a well established common name, but I found it referred to as the ‘sand bear-spider’ by Steven Falk on Flickr (check out his lovely photo set), which I quite like. The genus name Arctosa is based on the Greek word for bear, ἄρκτος (arctos). The species name ‘perita‘ means ‘mountain dweller’ in Greek which doesn’t make a whole lot of sense unless you consider the sand dunes that are apparently the preferred habitat of this species to be very small mountains. 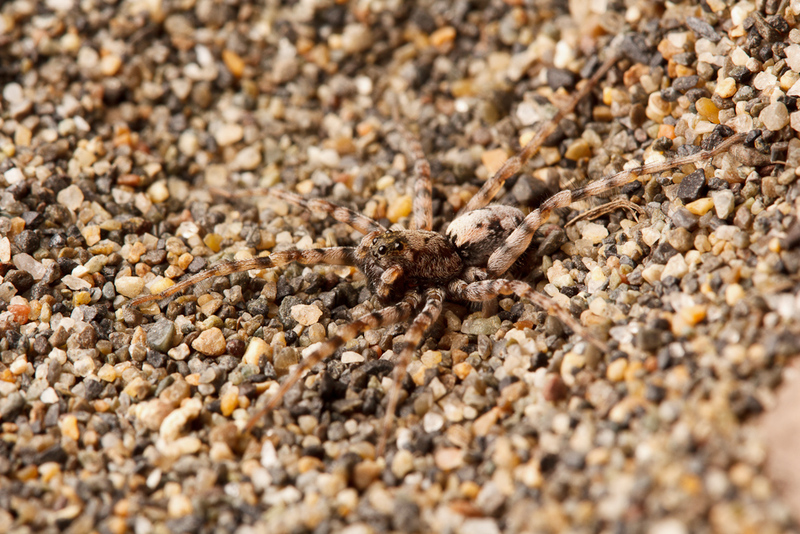 I will now always think of it as the mysterious burrow-dwelling tiny sandy mountain bear-spider! Catchy, right? The type genus is Lycosa, which of course means ‘wolf’. Several other genera were subsequently named to rhyme with Lycosa, with the names based on other carnivorous animals: Alopecosa (fox), Crocodilosa, Dingosa, Hyaenosa, Lynxosa, Mustelicosa (weasel), and Pardosa (leopard). Dondale, C. D., & Redner, J. H. (1983). Revision of the wolf spiders of the genus Arctosa CL Koch in North and Central America (Araneae: Lycosidae). Journal of Arachnology, 11: 1–30. Dondale, C. D., & Redner, J. H. (1990). The insects and arachnids of Canada. Part 17. The wolf spiders, nurseryweb spiders, and lynx spiders of Canada and Alaska. Araneae: Lycosidae, Pisauridae, and Oxyopidae. Publication-Agriculture Canada (English ; 1856).